Rachel Elizabeth Dare. 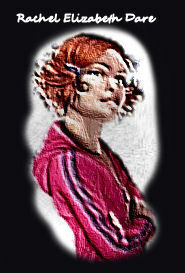 I was bored so I edited the heck out of Rachel's picture, so here it is!. Wallpaper and background images in the Percy Jackson & The Olympians 本 club tagged: percy jackson rachel. This Percy Jackson & The Olympians 本 fan art might contain アニメ, 漫画, マンガ, and コミック.